If you're looking into rooting your device yourself, you're going to need ADB and Fastboot on your computer. The Android Debug Bridge (ADB), is a command-line-based tool that allows for interaction between your computer and your Linux-based Android device. Fastboot is an engineering protocol that allows modification to file system images from a computer over a USB connection. Both ADB and Fastboot are packaged as a part of the Android Software Development Kit (SDK), and allow you to perform simple tasks like pushing and pulling files from your device, but they can also manipulate your bootloader and install custom recoveries. Usually, you would have to install the Android SDK to get both tools, but today I'm going to show you how to get both on your Mac in less than 5 minutes! Allow the script to run and you'll be all set. Now the ADB and Fastboot files will be placed in /usr/bin/ on your Mac. Note: Change Desktop/Android above to the location of the extracted .zip if you didn't place it on you Desktop like I did. 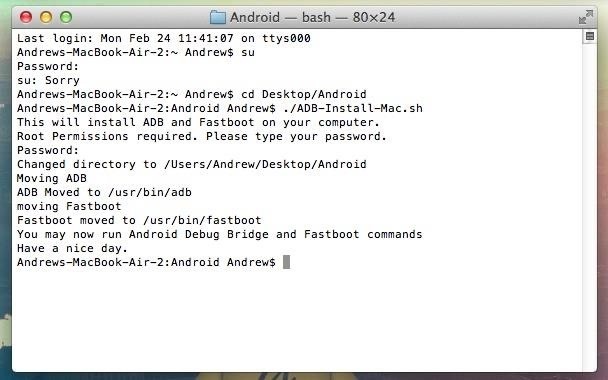 With ADB and Fastboot, you'll be able to run commands from your Mac onto your HTC One or other Android device. This will come in handy when you are rooting your device or backing up your data. When you type 'adb devices' into terminal does it give you a list of devices? Try switching USB ports, that can be an issue sometimes. Also be sure to have USB Debugging enabled on your devices before hand. You may also want to check your /usr/bin/ folder and make sure adb and fastboot are there. To check open Finder hit Shift, Command and G all at the same time and type /usr/bin/ in the box that pops up. If they are not there that means something went wrong in the install script. You can manually add them to that folder. So just unzip the Android.zip file again and place them in there. I'm running into a similar problem on my end. Perhaps the ADB files are outdated? I ended up using the Nexus Tools method, and it installed. how can i do it on windows ?! Follow this guide to get ADB set up on windows. After that, it worked great. Thanks! My issue isn't the installation of adb or fastboot, but rather that the HTC One doesn't prompt for the transferring of the SSH Public keys (like it does on Windows devices). As of 4.4 (KitKat) adb won't recognize any devices that haven't been authenticated. So how does one go about authenticating the device on Mac? On Windows its just a matter of installing the google drivers and getting them updated in device manager. When you plug in your device do you see a pop up on your phone asking to accept the connection? What if I'm stuck on unlock key in step?? Thanks for this. If your a mac user, it's probably a lot easier to just drag and drop the files into the /usr/bin/ directory. Thats all the ADB-Install-Mac.sh is supposed to do anyway, however the script didn't execute properly for me. Dragging and dropping resolved the issue. Not only did the script not work for me, it won't even let me drag and drop into the usr/bin folder. Suggestions? What error are you getting when you drag and drop? If you place your phone in recovery mode you can send ADB commands through TWRP. I just checked and the zip linked in the guide should just have the .zip extension. Retry the download and let me know if the .dmg extension is still there. It is possible to do this without admin rights? No, you need the admin rights to add files to the bin directory. Did you unzip the downloaded file and place the extracted folder on the desktop? The ADB/fastboot commands are installed system wide so you can use them anytime you open up Terminal. I used your file and it all worked fine... so THANKS! BUT Recently I updated from Yosemite to El Capitan... and now ADB does not work anymore, and even re-installing your script yields no results. You can download the file again, unzip and then manually place the adb and fastboot files in your /usr/bin/ folder. El Capitan won't give permission. it starts working but i dont see any progress or idee of where it is. so i wanted to add -p to the command which should show me a progress, but this does not seem to be included in this adb, how do i get it included? Check out this stackoverdlow thread. Hi there...I installed this because I need to run "fastboot reboot" to power up my android on my Mac because it has a broken on / off button http://forum.xda-developers.com/droid-turbo/help/power-button-broken-workaround-t3157271. Only problem is I don't quite understand how I use the "fastboot reboot" command in terminal once I've followed the above installation instructions, i.e. at what point / where do I type in the command in Terminal (it's been a while since I've done anything in Terminal or on the command line). Thanks! I have some changes and explanations. echo "This will install ADB and Fastboot on your computer." echo "Root Permissions required. Please type your password." echo "ADB Moved to /usr/bin/adb"
echo "Fastboot moved to /usr/bin/fastboot"
echo "You may now run Android Debug Bridge and Fastboot commands"
echo "Have a nice day." If you have problems when you run the script, it's maybe because you can't copy or move the files to "/usr/bin/" folder. 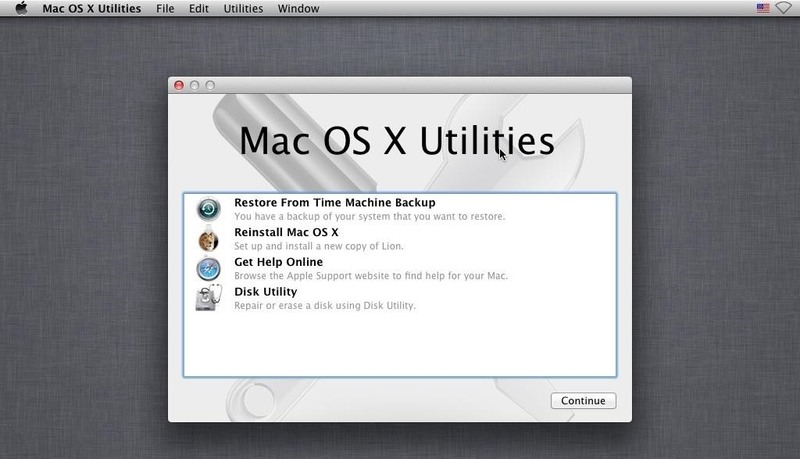 Enter Recovery Mode: Turn on your Mac and press cmd + R untill the screen changes. Click on Utilities ant the Menu bar and select "Terminal". Open terminal in your Mac and run "/ADB-Install-Mac.sh" again.